Brand new in boxes, Swarovski amethyst pendant with 2 Swarovski stones to the back symbolic to the brand with amethyst face and crystal detailing to the pendant link to necklace chain. Amethyst face to the ring with Swarovski band detailing Size 58, please refer to Swarovski website for more info on ring equivalent sizes. This set is now discontinued by Swarovski. This stunning set consists of a bangle, ring and earrings. They are all hallmarked with 925 for sterling silver and the bangle is fully hallmarked with the makers mark "S&Co", the lion passant, Birmingham assay mark and date mark "x" 1997. A full British hallmark is clearly impressed to the pendant, while each earring & the necklace are stamped 925. Necklace length 18" approximate without pendant. I have worn them once, around a year ago, & since then they have been untouched & are in perfect, clean condition. Pendant - overall size 19 mm x 11mm including bale (no chain). WILL ARRIVE GIFT BOXED. Colour - Purple. Shape - Round. Gemstones are authentic and genuine, hence apart from looking and feeling fantastic they are also known to bestow the wearer with wonderful gifts. Gem has natural inclusions (Mother Nature's finger prints), further confirming its authenticity! Earrings have a leaver back fastening and a 5cm (approx) drop. Gem stone details below. Originally bought from Gems TV. Total Gem Weight: 9.775 Ct. Total Gem Weight: 19.550 Ct. Shape: ROUND. Shape: FANCY. Amethyst and CZ Pendant and Earrings Set Solid Sterling Silver Twist. Dispatched with Royal Mail 1st Class. Worn once so in excellent condition. RRP around £95.00. Would be an amazing birthday present. Thank you for looking. 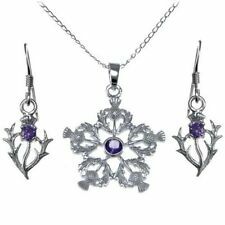 This is a beautifully faceted cut sparkling bespoke matching jewellery set of sterling silver earrings and necklace. These gemstones are hand set in sterling silver in a bezel setting that showcases the gemstones perfectly! The pendant is fully hallmarked on the rear, and the earrings on the pins, for Edinburgh 1999. The set is in excellent condition. Pendant - overall size 18 mm x 9mm including bale, no chain so wear your favourite. WILL ARRIVE GIFT BOXED. Platinum Overlay. Pendant, Stud. One of TJC’s founding principles is to do the right thing and our One for One charity ensures we do just that! Fashion Accessories. 925 parts per 1000. Sterling Silver. Sirena Jewellery. All our jewellery is 100% authentic, not plated or filled. Jewellery Type. Jewellery Sets. The ring is a UK size M. The earrings are push-back with a butterfly fastening. 925 Sterling Silver. Splendid solid silver set. Jewellery box is for display purposes only. Pendent width = 13mm. Earrings with Necklace. This set consists of a necklace and earrings. This can also be a wonderful treat for your-self. Pendant length = 30mm. Chain length = 18". Stone Shape/Cut: Pear. Earring Information. Necklace Information. Natural/Created: Natural Mined Stone. 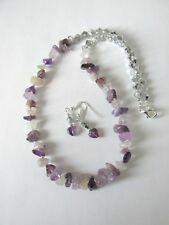 Peach quartzite and light amethyst necklace, bracelet & earrings set. Pair of drop earring with sterling silver earring hooks approx length 3cm. 9ct yellow/white gold necklace and earrings set by Jonathan Burge. 16in yellow gold chain. Very good condition and nice quality set. This unusual set features a choker style necklace, a bracelet and earrings with a shepherds hook. The necklace is 40cm in length, the bracelet is 18cm in length. Earrings - overall size 16mm x9 mm and they have an integral fastening so there is no butterfly to lose. ELEGANT TRILLION SET. This is for hygiene reasons and doesn’t affect your statutory rights. CENTRE STONE SIZE: 7mm x 7mm. EARRINGS SIZE: 16mm x 8mm. PENDANT SIZE: 14mm x 8mm. SET WEIGHT: 4.6g. A pretty pendant with matching earrings. All fittings are real 9ct gold (NOT plated, rolled or filled gold). This does not affect your statutory rights. White Gold 6 Carat Amethyst Ring With 3 Diamond Mount at either Sides. Condition is Used, but in excellent condition, only worn a few times. Bought in India for £800 10 years ago, so worth a lot more now, Indian hall marked white gold. Size letter L. Square cut amethyst measures 1cm in length and width. Dispatched via signed for courier. This is a beautiful one-of-a-kind necklace, earrings and ring set. Earrings - overall size 16mm x14 mm and they have an integral fastening so there is no butterfly to lose. Pendant - overall size 24 mm x 14mm including bale (no chain). Grab a bargain and save on individual item prices. Earrings - overall size 32mm x15 mm and they have an integral fastening so there is no butterfly to lose. Pendant - overall size 24 mm x 17mm including bale, no chain so wear your favourite. Pendant - overall size 20 mm x 13mm including bale, no chain so you can wear your favourite. Earrings - overall size 30mm x 10mm and they have an integral fastening so there is no butterfly to lose. Pendant - overall size 20 mm x 10mm including bale, no chain so you can wear your favourite. (We also have a range of other services including ring engraving, jewellery cleaning, gold and silver restoration and valuation services. st Classed Signed For). Hallmarking : Fully Hallmarked '375' & Assayed. 8 HTT 2007033 070218. It is held in a solid-sided open setting, such that the light passes through the gemstone. Width of chain: 2mm. In good clean condition, has been cleaned and thoroughly sterilised. This would be sure to add the finishing touch to any outfit and would make a great gift for a loved one. Pendant - overall size 29 mm x 7mm including bale, no chain so you can wear your favourite. WILL ARRIVE GIFT BOXED. A regal stone worn by royalty throughout the ages, amethyst fine jewellery is sure to be treasured by whoever owns and wears it. This pretty stone in varying hues of purple is found in necklaces , earrings, bracelets, brooches and rings and looks beautiful set against precious metals including shades of gold and silver. Amethyst was once considered one of the most precious stones and was also expensive. With its purple colour historically associated with royalty and wealth, it has been worn by monarchs around the world through the ages and also decorates the British Crown Jewels. Amethyst is now more widely available, making it more affordable for people to buy. Amethyst jewellery would make a perfect romantic gift at Christmas or on a birthday, an anniversary, Valentine's Day or Mother's Day. As the birthstone of the month of February amethyst jewellery would make an ideal present for someone with a birthday, or to mark the birth of a baby, in this month. Amethysts come in a variety of shades, from vivid purple to mauve, violet and lilac. They can have flashes of red and blue. A pale lilac shade is known as Rose de France. Deep Russians are dark purple with hints of blue and red and are rare and expensive. Stunning and feminine Rose de France matching earrings and necklace set in sterling silver make a perfect statement accessory. 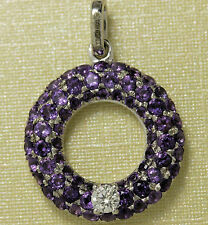 Amethysts looking striking when paired with sparkling diamonds and this combination can be found in a variety of sets. Choose an elegant matching amethyst and diamond twist earrings and pendant necklace with yellow gold chain, or a sterling silver amethyst and diamond cluster necklace set. Amethyst and diamonds also make a striking engagement ring - a bride to be is sure to be delighted with a 9ct gold band filled with amethysts and diamonds. For the lover of vintage jewellery you can find matching Art Deco amethyst stud earrings and a ring, set with a rectangular stone. Equally attractive is a vintage yellow gold amethyst and diamond pendant necklace. For something a bit different try a Celtic-style sterling silver matching bracelet and necklace set with oval amethyst stones, or a pretty floral design 9ct gold necklace and earrings set with amethyst clusters. Amethyst is easy to look after and can be cleaned with warm water and a mild soap using a soft cloth. As it is a quartz stone amethyst is hard and durable, and resistant to wear and tear.